A presentation copy of the first 1936 authorised English edition of Ulysses made 15,000 at the Mealy’s sale in Castlecomer on July 29. Signed by James Joyce it was published by John Lane, Bodley Head in a limited edition of 1,000 copies. An 1888 silver medal made in Dublin to commemorate a journey made by 48 Irish sportsmen to the US for the first hurling match on US soil made 3,250 and an All-Ireland Hurling Medal from the victorious 1904 Kilkenny team made 4,250. A register of operations carried out at Mercer’s Hospital, Dublin, from 1910 to 1920, covering the period around the 1916 Rising, made 2,500 over an estimate of 400-600. A Visitor’s Book for Beleek Pottery in Co. Fermanagh during the First Period from the 1840’s to the 1860’s made 2,700 over a top estimate of 700. Mealy’s reported huge interest in a sale which realised a quarter of a million euro. Around 80 per cent of 1,200 lots were sold. Prices were in general around the middle of the estimate. The classically inlaid Killarney workbox sold in Skibbereen. (click on image to enlarge). A Killarney lady’s workbox made a hammer price of 5,200 at the Morgan O’Driscoll sale in Skibbereen on Sunday, July 25. Classically inlaid with arbutus and other woods the table is decorated with the crown over the harp, scenes of Muckross Abbey, ferns and shamrocks. There is a beautifully fitted interior. The estimate on the piece had been 5,000-7,000, and when fees and VAT are added to the hammer price it will come in at around 6,300-6,400. A presentation copy of the first authorised English edition of Ulysses, signed by James Joyce, is lot number 700 at Mealy’s rare books, sporting mementoes and collectors sale on July 29. Published by John Lane, Bodley Head in 1936 it is from a limited edition of 1,000 copies. Bound in vellum with designs of a Homeric bow by Eric Gill on both covers it is estimated to make 14,000-18,000. The publication history of Ulysses is obscure. Notable editions include the first edition published in Paris in 1922 by Sylvia Beach, the pirated Roth edition published in New York in 1929, the Odyssey Press edition of 1932, the 1934 Random House US edition and the first English edition of the Bodley Head in 1936. The sale features work by Seamus Heaney, Samuel Beckett, John Banville, Michael Longley,W.B. Yeats and Patrick Kavanagh, as well as early manuscripts, rare pamphlets, catalogues, and periodicals. Among sporting memorabilia highlights is a memento of the first hurling game in the US in 1888. A silver medal inscribed with a Celtic Cross and crossed hurleys commemorates a journey made by 48 Irish sportsmen to the US with a view to strengthening the interest of Irish exiles in the game. Made by E. Johnson, Dublin the medal is estimated to make 2,000-3,000. Other lots of sporting interest include a collection of All-Ireland medals from 1902-1919 and GAA programmes from 1937 to the 1960’s. This auction will be on view at Castlecomer, Co. Kilkenny from Monday July 26 and the sale is on Thursday, July 29 at 10.15 a.m.
* A copy of Oscar Wilde’s play Salome from 1893, with a handwritten dedication by the author to French symbolist painter Gustave Moreau, made £34,000 at a Dominic Winter Auctioneers sale on July 21 in Gloucestershire. Moreau’s paintings of Salome are said to have inspired the play, which in turn inspired Richard Strauss to compose the opera. THIS painting by John E. Fernely Sn. (1782 - 1860) and studio - Mares beside a Stable - made 7,200 at Mealy's. 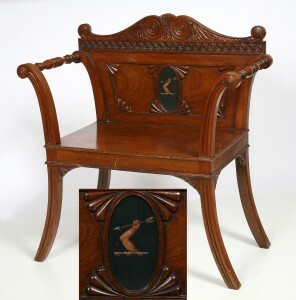 This Irish Regency hall chair made a hammer price of 24,000 at Mealy's. (click on image to enlarge). A rare Irish Regency crested mahogany Hall Seat with leaf carved scroll top rail above a frieze and an oval painted crest was the top lot at the Mealy’s country house sale at Hermitage, Drinagh, Co. Wexford on July 20. It made a hammer price of 24,000 (around 30,000 when fees are added) over an estimate of 4,000-6,000. Mealy’s said that examples with such close resemblance to James Wyatt’s design for the Castle Coole Suite of Hall Benches in Co. Fermanagh are widely admired and desired, but are rarely encountered on the open market. This piece captured the essential features such as scrolled arms and splayed legs with the additional symptomatic characteristic of a painted oval crest, heralding the prestige of its original owners. 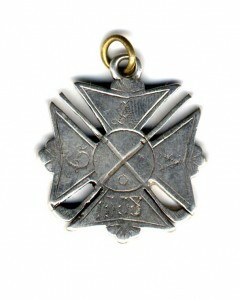 Families with comparable insignia included Baker, Bowdler, Carleton, Colt, Elliot-Murray-Kynunmount, Mackenzie, Pickford and others. The sale of 486 lots brought in an above estimate total of around 290,000. A painting by John E. Fernely Sn. 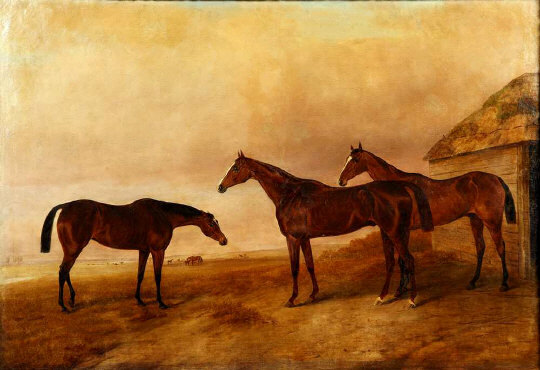 (1782 – 1860) and studio – Mares beside a Stable – made 7,200 against a top estimate of 6,000. The first ever auction sale at Chatsworth, the most magnificent of all England’s stately homes, will be held in the grounds from October 5-7 next. Sotheby’s will conduct Chatsworth: The Attic Sale which will comprise some 20,000 objects in around 1,400 lots It is estimated to bring in around £2.5 million. Many of the British landed gentry are facing financial challenges at a time when the world market for English heritage is buoyant. In the first week of July More than £50 million worth of art and antiques from British stately homes were sold at auctions in London. The Althorp sales brought in around £21 million, the Marquis of Lothian sold an exceptional wine cooler and the Earl of Rosebery sold Turner’s Modern Rome – Campo Vaccino. 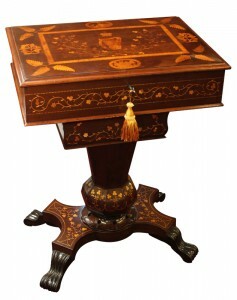 (See posts on antiquesandartireland.com for July 7, July 6 and June 7). 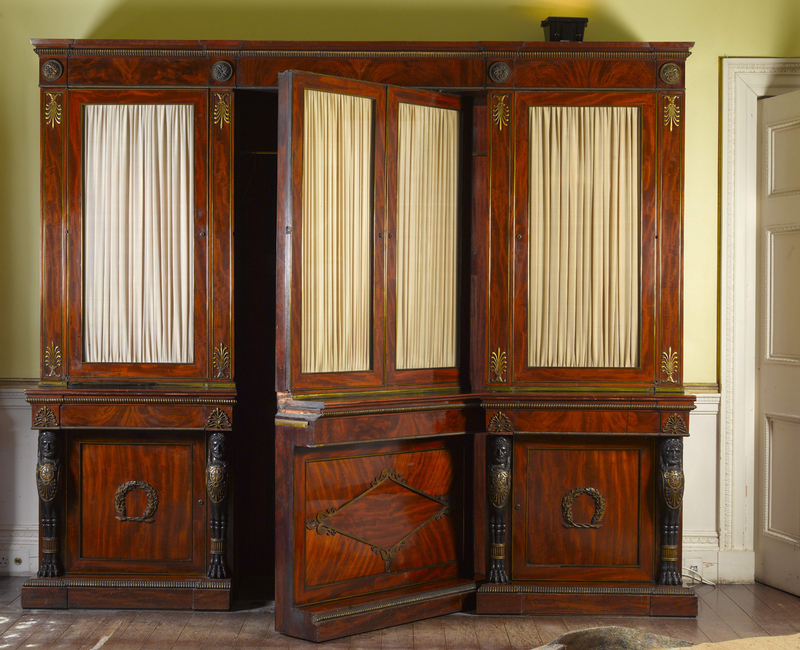 The core of the Chatsworth sale is a wealth of fine, rare architectural fixtures and fittings – fireplaces, architraves, doors and shutters – once part of the many great houses that have featured in the Devonshire family’s extraordinary history. These include Chatsworth, Chiswick House, Hardwick Hall, Lismore Castle in Co. Waterford, Compton Place, Bolton Abbey and Devonshire House on Piccadilly. Demolished in the 1920’s this pile stretched from Green Park to Berkeley Square. Estimates range from £20 to £200,000. The Duke of Devonshire, a collector of modern art who is closely involved in Lismore Castle Arts (see post on Irish Art Galleries for details of the current show there), said that proceeds will be used to further some projects at Chatsworth and other Devonshire estates, which will now be accelerated. Chatsworth has been restored in a £14 million five year renovation project. 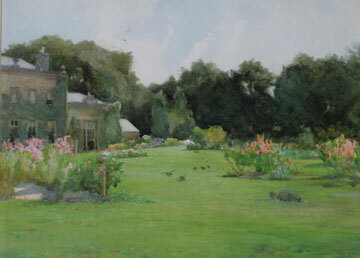 THIS watercolour by Mildred Ann Butler RWS (1858-1941) made a hammer price of 10,400 at the Sheppards of Durrow house sale at Kilmurry House, Thomastown in Co. Kilkenny on Monday July 12. The house was the residence of the artist and has recently been sold. The two day sale was 95 per cent sold by lot and brought in a hammer total of 312,000. THIS Irish longcase clock made £11,875 in London. AN Irish longcase clock made £11,875 at the Spencer House sale in London in July over a top estimate of £4,000. The George III mahogany striking eight day longcase clock was made by George Furnace in Dublin circa 1770. George Furnace is recorded working in Dublin from 1751 to 1781. The top price of £802,850 at this sale was paid for a pair of George II sabicu and lime open armchairs (pictured right) thought to be designed by James ‘Athenian’ Stuart and probably supplied between 1758-1765. The sale of the items from Althorp, family home of Princess Diana, raised a total of £21,076,288 at Christie’s in London. Included in this total is furniture, art and porcelain from Spencer House, the family’s London town house until 1924. The 70 lots sold from here brought in £4,857,750. The top lot from Althorp was A Commander Being Armed for Battle by Sir Peter Paul Rubens which made £9,001,250 – the second highest price for the artist at auction. J.M.W. 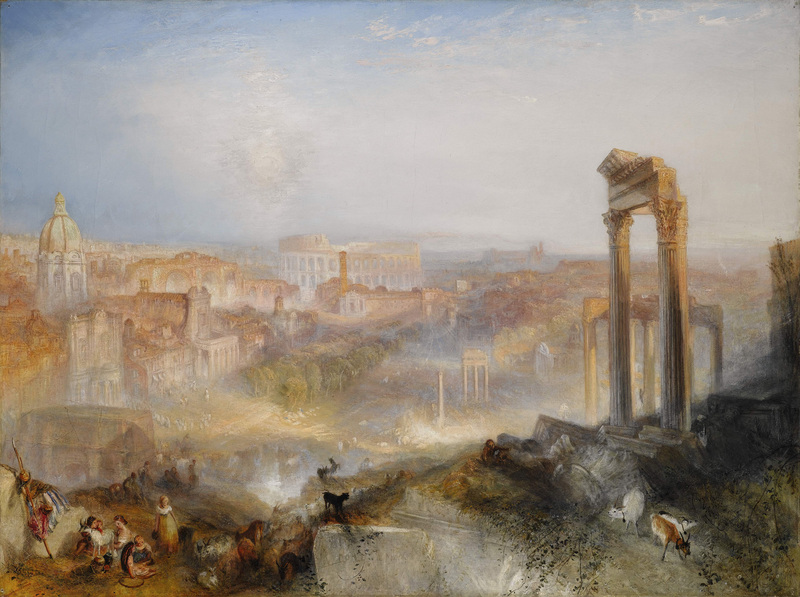 Turner’s 1839 masterpiece Modern Rome – Campo Vaccino sold for a record £29,721,250 / €35,727,792 at Sotheby’s in London on July 7. It was bought by Hazlett, Gooden & Fox on behalf of The J. Paul Getty Museum in Los Angeles. The previous record for a Turner was £20.5 million set in 2006. This was the top selling lot in the summer evening sale of Old Master & British Paintings which brought in an above estimate total of £53,484,350 / €64,293,316 and established nine new artist records for Turner, Jan Lievens, Bernard van Orley, Barnaba da Modena, Ludwig Schongauer, Paul Bril, James Ward, Francesco di Simone da Santa Croce and Ottavio Vannini. Buyers came from 15 different countries. On the previous evening in London a painting by Flemish master Peter Paul Rubens made nine million pounds at Christie’s. “A Commander being armed for Battle,” was painted in 1613 or 1614 and had been at Althorp, ancestral home of Princess Diana, for over 200 years. The Christie’s sale brought in 42.3 million pounds. most important piece of English silver to come on the market for 50 years. It was sold to a private Asian buyer. Sotheby’s 21 lot Treasures sale brought in an above estimate total of £13,951,250 and was described by Mario Tavella, Sotheby’s deputy chairman Europe as a fantastic achievement in the field of decorative arts. There was buying from Europe, the United States, Russia, Asia and the Middle East. 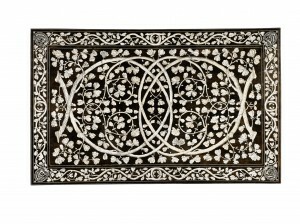 An Italian engraved ivory inlaid rosewood centre table, made for the Duke of Urbino Francesco Maria II Della Rovere (1549-1631), c 1596-7, and subsequently part of the collection of the Medici family, made £937,250. 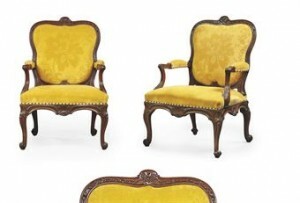 Its Medici provenance was unknown when it was sold for £6,000 at auction in 1989. A North German amber casket bearing the arms of Prince William IV of Orange and Anne, Princess Royal of Great Britain, probably made in Danzig around 1734, realised £657,250 well beyond its pre-sale estimate of £200,000-300,000. (See earlier post for June 7 on antiquesandartireland.com). 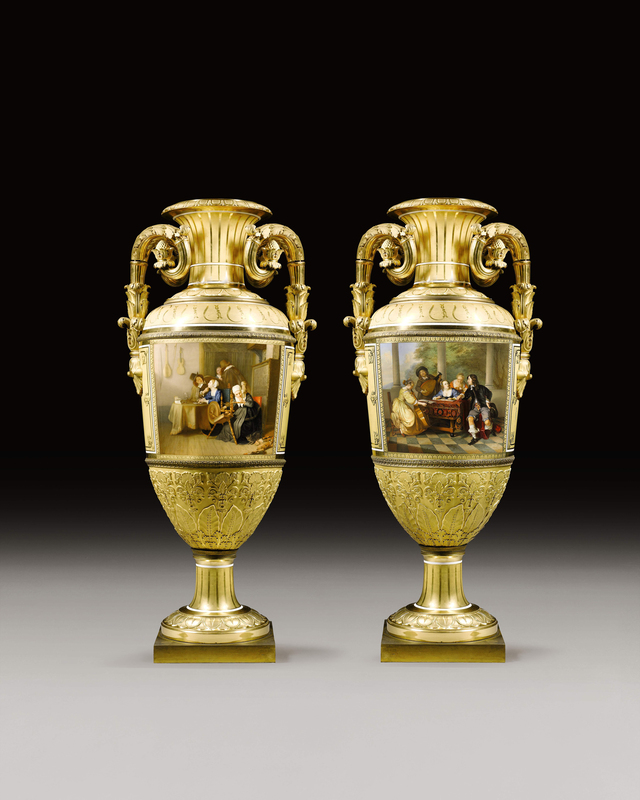 A pair of porcelain vases from the Imperial Porcelain Manufactory, St Petersburg in 1842 made £1,945,250. A set of three ivory painted and parcel-gilt Royal Pliants by Jean-Baptiste-Claude Séné (1748-1803) made for Queen Marie Antoinette’s Salon des Jeux at the Châteaux of Compiègne and Fontainebleau, c1786-87, made £541,250. A total of six sales at Sotheby’s in London on July 6, Old Master Drawings, Western manuscripts and miniatures,, furniture, decorative arts and silver, and aristocratic heirlooms made a combined total of £27,488,438. 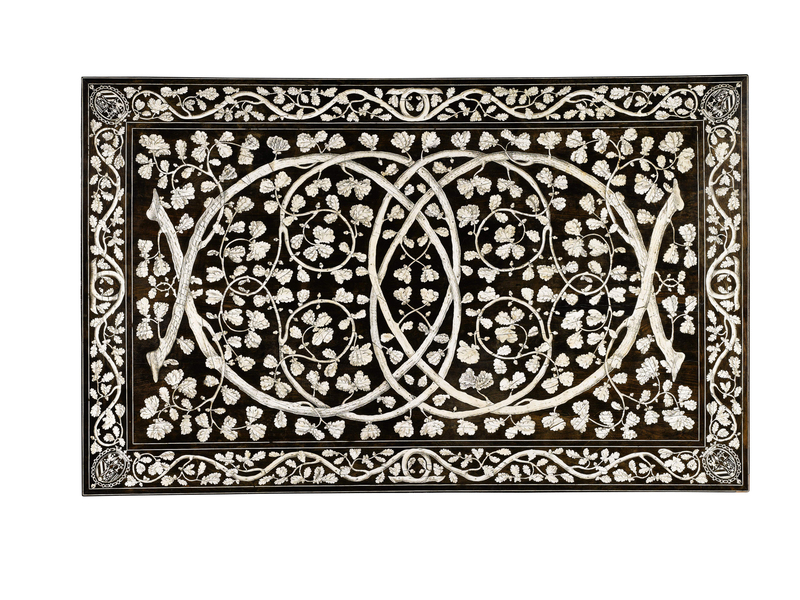 THIS collection of Victorian cut and mirrored glass table centrepieces c1880 is thought to have been purchased by John Poyntz, 5th Earl Spencer, while serving as Viceroy of Ireland in 1882-1885. It is pictured adorning a table at the Vice-Regal Lodge in Dublin (now Aras an Uachtarain) in the 1880’s in the Christie’s catalogue for the Althorp Attic sale in London on July 7-8. Lot 177, which has some damage, comprises three oblong centrepieces, each with a roundel bearing the Spencer coat-of-arms with Poyntz, the three arches supported by cluster columns and supporting candlebranches, vases and droplets, on purple velvet base with ceramic castors. There are losses to all three, with further component parts for two further centrepieces which are incomplete. 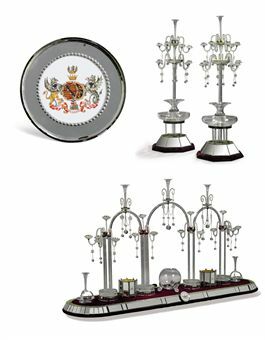 The lot includes a pair of twelve-branch candelabra en suite, lacking some drops, with a third incomplete candelabrum and component parts for a fourth. Possibly made in Ireland, it was brought to Althorp after 1885. It is estimated to make 15,000-25,000 sterling. 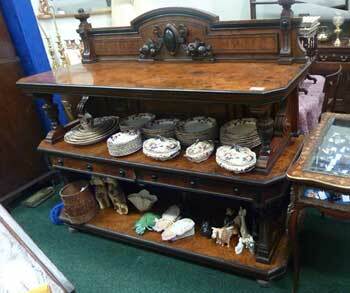 The sale also features 13 horse drawn carriages of various types. Two of them, an early Victorian dark green Japanned private coach (40,000-60,000) and a George IV livery painted barouche (20,000-30,000) are photographed with the Spencer family in Dublin. UPDATE: THE attic sale brought in £2,024,038 /€2,426,822 – more than doubling pre-sale expectations. Christie’s sales of The Spencer Collections realised a total of £21,076,288 / €25,360,494. 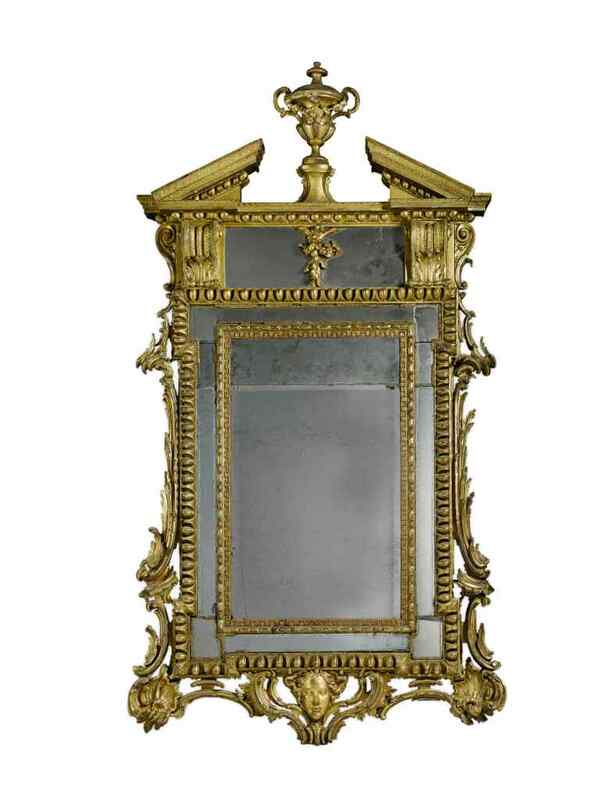 A c1750 George II carved giltwood wall mirror attributed to Dublin makers John and Francis Booker features at Sotheby’s sale of Important Furniture, Silver and Ceramics in London on July 6. Working from published designs, such as those in William Jones The Gentleman`s or Builders Companion of 1739, the Bookers evolved a highly distinctive style of mirror, characterised by the use of conspicuous architectural elements of Baroque and Palladian inspiration. Such details can be seen in the present lot in the form of the pediment, the scroll carved corbels and the prolific use of egg and dart carving. This one, from an English private collection, is estimated at 40,000-60,000. A second c1770 carved giltwood wall mirror by the Bookers, thought probably supplied to Richard Rochfort, first Earl of Belvedere ( 1708-74) for Belvedere, Mullingar, Co.Westmeath. features in the same sale. It is estimated at 35,000-40,000. The Knight of Glin and James Peill, Irish Furniture, 2007, pp.141, 142, 144 and 261. Graham Child, World Mirrors 1650-1900, 1990, p.122. Geoffrey Wills, English Looking Glasses, 1965, p.84. UPDATE: The mirror made 115,250 in a sale which realised 4.1 million. 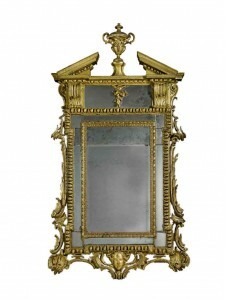 At the same sale a c1770 carved giltwood wall mirror by the Bookers made 97,250.